Sorry, this isnt for a swing set but instead for accessories for one. Open to the continental US residents, you have through 12/9 to enter. Good luck. 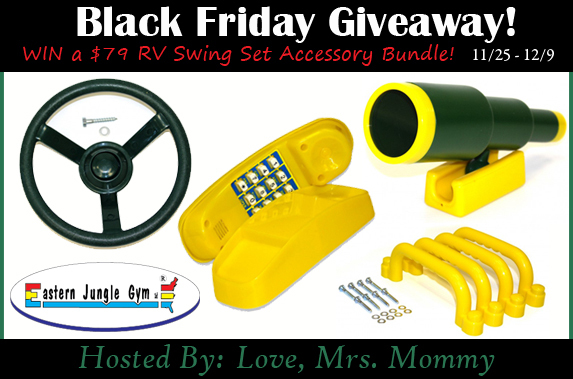 Eastern Jungle Gym Swing Set Accessory Bundle Giveaway! $79 RV! Swing Set Accessory Bundle Multi-Pack! A $79 RV! 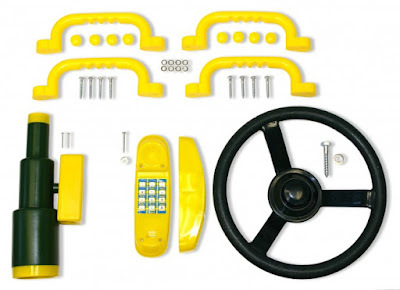 Just think of all the fun your child(ren) will have playing with all these goodies! All pieces are constructed with top-quality materials and include mounting hardware. This bundle will bring new life to your current outdoor swing set, or you can use it to help build your own backyard playground! Click here to read Love, Mrs. Mommy's full Eastern Jungle Gym review! Giveaway Dates ~ 11/25 12:01 AM EST through 12/9 11:59 PM EST Good luck! Disclosure: Love, Mrs. Mommy and all participating bloggers are not held responsible for sponsors who do not fulfill their prize obligations. Love, Mrs. Mommy received an Eastern Jungle Gym Classic Cedar Bench Swing Set at no cost to facilitate the above-mentioned review. This giveaway is in no way endorsed or sponsored by Facebook or any other social media site. The winner will be randomly drawn by Giveaway Tools and will be notified by email. Winner has 48 hours to reply before a replacement winner will be drawn. If you would like to participate in an event like this please contact LoveMrsMommy (at) gmail (dot) com.